Congestion on northern Colorado roads is an increasing problem, consuming both our time and patience. The bus works well for some, but with several routes running only once or twice an hour, and other parts of town receiving no bus service at all, it remains an inadequate solution for many. Bicycling is a popular alternative. And with our growing number of bikeways, improvements to bike trails, and ever increasing miles of bike lanes, it’s getting better all the time. But for some folks, bicycling long distances, or in hilly areas, can be the deciding factor that keeps them from using bicycling for transportation. One solution, when hills or distance are a problem, is to use an electric bike that can be pedaled like a normal bicycle until assistance is needed. Although not currently allowed on Fort Collins bike trails, e-bikes can still be used on city streets. Today’s guest post is from Jeff Johnson and covers what an electric bike is, how they work, and what the advantages of using them are. Image via Pixabay with a Creative Commons license. The electric bike is a new cycling technology to keep an eye on. A growing number of casual cyclists and commuters have made the electric bike a central part of their lives, and even small delivery businesses are eyeing the technology to handle urban deliveries. Online companies are serving this expanding market with innovative electric bikes and conversion kits and as the New York Times reports, electric bike sales are growing the fastest in places like Europe and China, though they are catching on here in the United States as well. 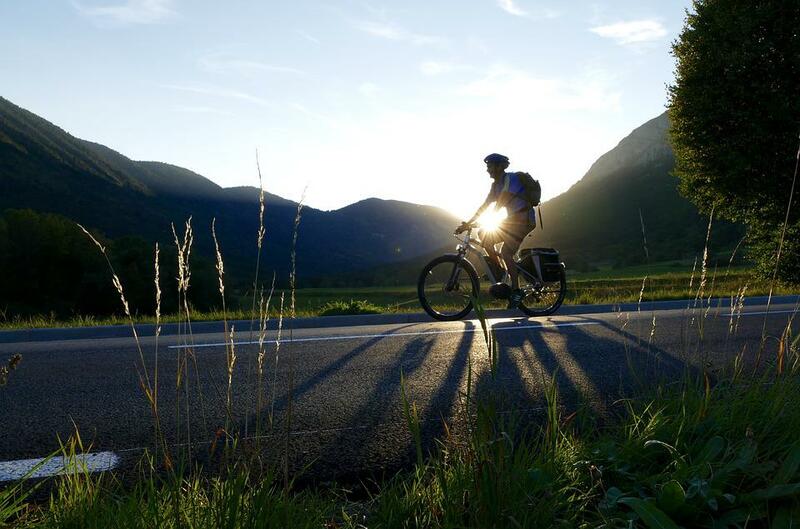 In Colorado, companies like Small Planet E-Bikes and Colorado Electric Bikes serve the mountainous state with e-bikes for sale, which are perfect for cyclists looking to climb those tough hills! But, what exactly is an electric bike? What technologies go into making one work? Let’s go over the basics of e-bike technology and how cyclists in mountainous areas can enhance their ride. While electric bikes are taking a little more time to catch on in much of the United States, they’re becoming quite popular in health-centric, bike-friendly cities. Places like Fort Collins are perfect for the electric bike: with its relatively flat terrain and generous bike lanes, the electric bike is well-suited for daily commutes and casual riding in the Fort Collins area. Adventurous riders going into the foothills in the west, and to the mountains further on will find the powered assist a welcome companion for climbing hills. However, keep in mind that local laws haven’t completely caught up with electric bikes. Colorado’s bicycle laws mention “electric assisted bicycles” once. Though some cities like New York are cracking down on e-bikes, chiefly because of delivery bikes, most parts of the country are fine for electric bike riders. Commuters and cyclists are taking to e-bikes everywhere, and having a lot of fun with them in the process. Electric bikes basically consist of a high-tech upgrade to the traditional bike platform. Electric bikes are still powered by gears, chains, cranksets, and pedals, but they have the benefit of an added electric motor, which is powered by a rechargeable battery. But, what makes an electric bike different from a moped or an electric scooter? Some electric bikes are powerful enough to function as a moped, but as LEED Electric Bike notes, what all electric bikes have in common is that they are able to be manually pedaled. The battery-powered motor adds a supplemental boost to the rider’s own pedaling power. Though there are local and county governments that discourage or ban electric bikes from unpaved trails, there are bike kit manufacturers such as LEED that produce solutions that are legally compliant. With 250-watt and 500-watt bike kits that provide pedal assist, these models comply with federal laws mandating electric bikes not exceed 20 mph. The wonderful thing about this design is that it allows the rider to pedal as much as they want, benefiting from the physical exercise that a traditional bike provides in the process. If riders need to get over tough hills, or travel longer distances at higher speeds, all they need to do is toggle the electric motor and away they go, which makes them ideal for open riding through places like northern Colorado. Buyers can opt for brand new and fully equipped electric bikes, though these often end up on the pricier side. Old bikes can also be converted to electric bikes with conversion kits, which tend to offset costs while providing the same functionality. Electric bikes can go anywhere from 16 to 28 mph or so, depending on whether you are using your own pedal power. The hub motor is one of the most common features found on electric bikes. This motor is electrically powered via a mounted battery, and is built into the front or back wheel hub, depending on whether a bike or trike is being used. Hub motors operate in addition to the bike’s pedals, supplying additional power to the bikes free wheel. There are many different types of hub motors available on the market. Another type of motor, known as the mid-drive system, interfaces with the bike’s crankset in order to turn the pedals themselves, providing extra power for the rider. As there are different types of motors, there are also different ways to engage the motors. Pedelec bikes use magnetic Hall Effect sensors on the gear to engage the motor when the rider is pedaling. With these types of bikes, you can only use the motor when you are pedaling. Other types of bikes are known as power-on-demand e-bikes, which use twist and pull throttles to engage the motor independently. This way you can choose to supplement your pedal power when you want to, and some e-bikes are powerful enough to run on the motor alone. The e-bike battery usually comes in the form of a rechargeable lithium ion unit, which is connected to the motor via a network of wires that are run across the bike’s frame. Batteries feature differing capacities, and can provide power for average distances of 4 to 50 miles, depending on the model. Batteries often come in protective cases and bags, and can be mounted in various places on the bike, depending on the model. Converted electric bikes in particular tend to be relatively modular, so you can upgrade to larger capacity batteries if you prefer. Depending on the e-bike, there may be speedometers and battery level indicators available via mounted displays. Some e-bikes even have regenerative brakes that use the bike’s kinetic energy to slow the bike down without wearing out your brake pads. There are many different features to choose from in the market, and more are becoming available every day. What makes electric bikes and conversion kits appealing to riders is their versatility. Whether cyclists are looking for something that can tackle steep hills or long stretches of trails or roads, electric bikes are indicative of a bright future where independent transportation in the United States can encourage health and wellness in everyday life. So, whether you’ve been cycling for years or you’re looking for a way to get fit on-the-go, electric bikes are shaping up to be a sound investment with technology that can offer speed and power while allowing you to enjoy your ride. Jeff Johnson is a tech writer based in Colorado Springs. He’s a bike enthusiast, and loves to race around Mt. Cutler on his days off.